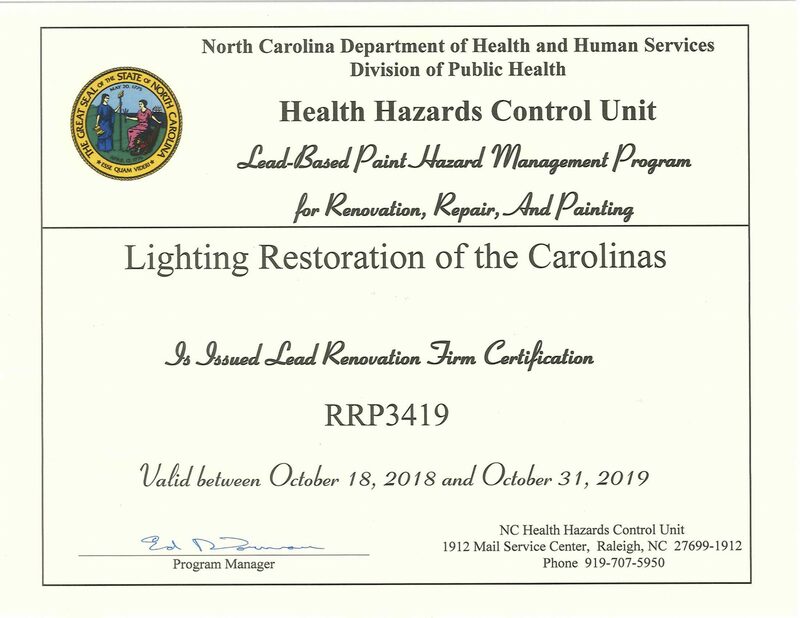 Lightning Restoration of the Carolinas is a local company with over 10 years of experience providing restoration services to residential and commercial clients. We are proud to be a preferred vendor for Insurance Agents, Insurance Carriers, Property Management Companies and Property Owners. Our experienced staff is committed to restoring your home or business back to it’s original condition and will work diligently with your insurance company to ensure that appropriate measures are being taken to minimize the cost and inconvenience that may occur as a result of property damage. Once a call is received in our office, we guarantee a licensed Lightning Restoration technician will be on-site within two hours. Upon arrival, the extent of your property damage is assessed to determine an immediate course of action. Our technicians will walk you through each step of the process to ensure that you have all of the information that you need to make the right decision before work begins. Lightning Restoration is an IICRC Certified Firm with a team of highly trained technicians dedicated to compassionate and friendly customer service. 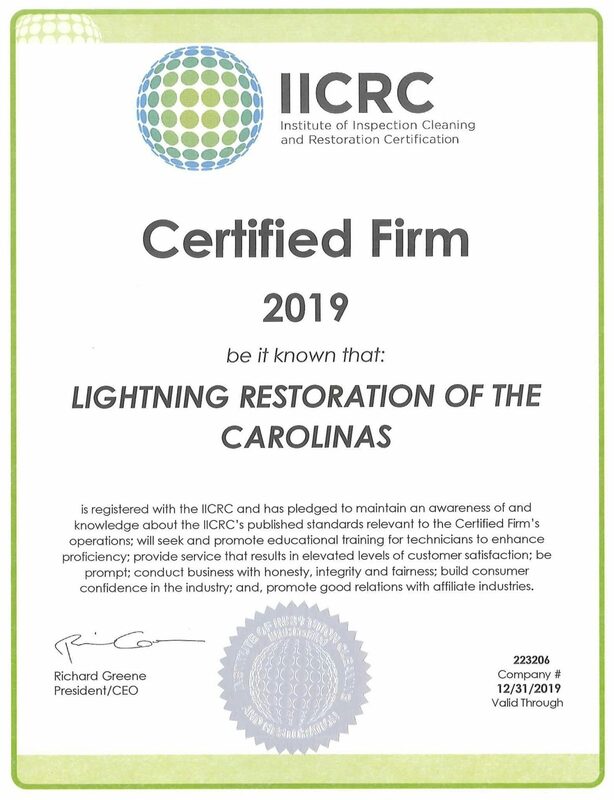 To ensure we are exceeding national standards and providing the highest quality restoration service possible, Lightning Restoration team members participate in consistent, on-going training in the latest technology and industry practices and are IICRC certified. Property damage can wreak havoc and disrupt lives. Our goal at Lightning Restoration is to help you restore your life quickly after property damage occurs and to provide stress free solutions to our clients when they need them most. The Lightning Restoration team has over 10 years of hands on experience assisting homeowners and business owners with their water, mold and fire/smoke losses. Put our experience to work for you! Lightning Restoration is a fully licensed, insured and IICRC certified firm. Lighting Restoration is here to handle your claim regardless of its size. Whether it is a small water damage claim or a complete renovation, trust our experts to get the job done right. You can rest assured that your claim is being handled by a team of experts that is unrivaled in the industry. At Lightning Restoration, your restoration is not done until it is done right. Lightning will work with you and your insurance carrier to ensure we are staying on track and on budget. Our associates will maintain consistent communication from the beginning to the end of the restoration process. Randy was born and raised in Southwest Virginia. He graduated from Radford University with a BBA in Finance and Insurance. He began his career with Kemper Insurance as a field adjuster handling multiple lines of insurance claims including commercial and residential property. He has worked many disasters including Hurricane Hugo in Virginia, Hurricane Andrew in Louisiana, Hurricane Ike in Texas as well as ice storms in North Carolina and hail storms in Texas. He successfully completed the Associate in Claims and Associate in Risk Management programs and maintains an active property adjusting license in NC, SC, GA, FL, LA and TX. His claims experience helped him transition into the risk management field. He worked as the Risk Manager for a Florida firm and two national staffing operations. His responsibilities included purchasing of insurance plans, implementation of safety programs, training and claims oversight. This lead to an opportunity as the VP of the Insurance Service Group, a new division, for a Florida based engineering firm that grossed over $10 million in 4 years while also assuming full time risk management responsibilities. In 2016 after extensive on the job and class room training he opened Lightning Restoration of the Carolinas. 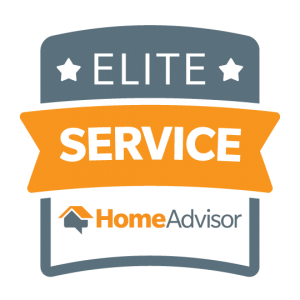 They service primarily the insurance industry providing water, mold, fire and smoke restoration to homeowners and businesses in Western North Carolina. 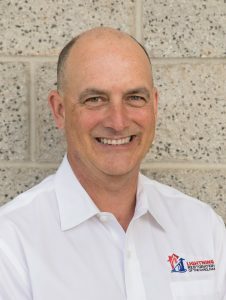 Laurin Czyzyk is a licensed general contractor with almost twenty years of experience working in the construction industry. After receiving degrees in Visual Arts/Design and Horticulture, Laurin began her career as a landscape designer, overseeing the installation of residential and commercial projects in and around Chicago. As her projects became larger in scale and scope, she became a licensed general contractor to manage all aspects. In 2011, Laurin joined a national facilities management company, working with clients and directing large scale commercial projects across the country. A North Carolina native, Laurin returned permanently to Asheville to raise her kids in the beauty of the Appalachian mountains- because there’s no place like home. She designs and builds homes, additions, and reconstruction/renovation projects. In 2018 she joined the team at Lightning Restoration to help homeowners recover from the devastation of loss after an emergency. Quality, integrity and customer service are the hallmark of the team at Lightning, and Laurin fits right in. 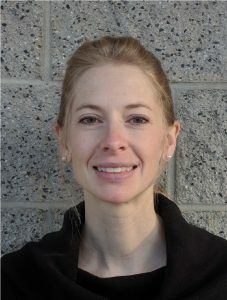 Laurin continues to study current construction methods and green design methodology to improve projects and the living experience her clients have with their homes. She is passionate about the advancement of women and minorities in the construction industry, making it a better place for everyone involved. Lightning Restoration of the Carolinas is THE answer for mold removal, fire and water restoration and site inventories and cleanup.